4 star addition to the Conjuring franchise. 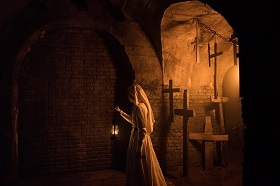 The Nun is written by James Wan (The Conjuring 2, Saw) and Gary Dauberman (It, Annabelle) and directed by Corin Hardy (The Hallow). It serves as a sequel to The Conjuring 2, giving a backstory to the terrifying character of Valak, the demonic nun. The year is 1952 and at the remote Abbey of St Carta in the backwoods of Romania, a young Nun takes her own life. When the body is discovered by a local man, Frenchie (Jonas Bloquet – Elle, 3 Days To Kill) while he is delivering supplies, the death is reported to the Vatican. 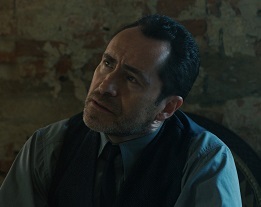 In response they dispatch an experienced priest, Father Burke (Demián Bichir – The Hateful Eight, Machete Kills) and a novitiate yet to take her vows, Sister Irene (Taissa Farmiga – Anna, The Final Girls) to investigate the death and attend to the wellbeing of the other nuns. Off they go into the wilds of Romania, escorted by Frenchie. The area surrounding the Abbey is thick with crosses and many graves and the whole place is regarded by the locals with extreme superstition, no-one but Frenchie will even go there. It is immediately apparent that all is not well, as they see hardly any other Sisters and receive a less than warm welcome. The nuns who are present believe they must keep up perpetual prayer in order to keep themselves safe. Sister Irene, already prone to visions, begins to sense a deep evil at the Abbey and suspects that their investigations are even more crucial than they first thought. Together they must try to destroy the evil which resides behind the mysterious door in the catacombs beneath them. The Nun makes an excellent addition to the Conjuring franchise, offering a different feel to the other films. 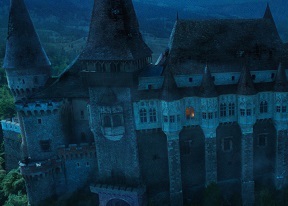 It is a very creepy and interesting location and there is plenty of atmosphere. The story is well written although simple and it ties in neatly with the other films. It also features a cameo from Vera Farmiga (The Conjuring 2, Source Code), reprising her role as Lorraine Warren. With lots of jump scares and good special effects this is a must own for fans of the franchise. 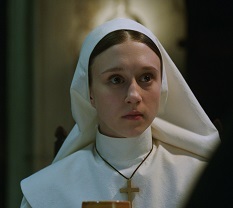 The Nun is available to buy now on DVD and Blu-ray.